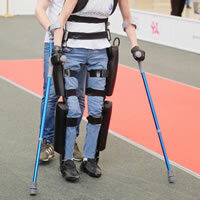 The device, known as an exoskeleton, is strapped to the outside of a person’s limbs and can then be controlled by them. There’s a very real difference between controlled haptics and a flat buzz, especially in a piece of wearable tech, and the haptics in the Apple Watch have that nuanced feel – its heartbeat-sharing delivers a softly detailed pulse. First autonomous delivery flights by parcelcopter in Europe authorised. Pingback: (EN) – New words: 27 July 2015 | Cambridge University Press | Glossarissimo!